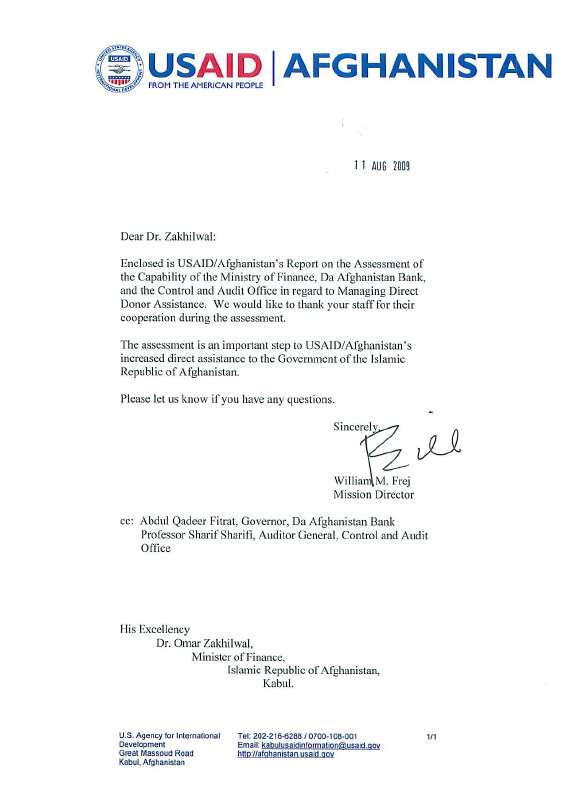 Our assessment of the Ministry of Finance (MoF) and Da Afghanistan Bank (DAB) disclosed that the financial management systems and procedures of the MoF and DAB are adequate for purposes of accounting for and managing funds that may be provided directly to the Government of the Islamic Republic of Afghanistan (GIRoA) by USAID. With regard to the Control and Audit Office (CAO), our review disclosed that the CAO has limited capacity to audit donor funds. This limitation, however, could be sufficiently mitigated by providing technical assistance to the CAO and through USAID/Afghanistan’s direct contracting for audit services as well as in-house Financial reviews performed by USAID/Afghanistan staff or RIG-approved audit firms. Our assessment disclosed that the MoF has adequate financial management capacity to effectively and efficiently record, account for and report on funds that may be provided directly by USAID to the GIRoA through direct budget support, sector assistance, host country contracting and/or other implementation modes. accountability Those reforms were also intended to align the budget with the Afghanistan National Development Strategy. The Treasury Directorate (TD) within the MoF has made significant improvements in its operations. The government-wide computerized system called Afghanistan Financial Management Information System (AFMIS), which is the official financial management system of the GIRoA, has been implemented in 15 line ministries, 14 budget entities, and 18 of the 34 Mastofiats in the provinces. Implementation at the remaining 16 provinces is underway and is expected to be completed by March 31,2010. The MoF Internal Audit Department’s (MoF-IAD’s) capacity has been strengthened since our last review in 2007. With the recent hiring and training of additional staff, there is reasonable assurance that USAID assistance would be adequately safeguarded from fraud, waste and misuse. The MoF-IAD could benefit from some technical assistance that USAID could provide for participation of its staff in study tours, workshops and conferences. DAB has the capacity and capability to provide quality services required of a modern central bank. The bank is rapidly making progress in implementing reforms to its policies and practices and installing modern banking systems. There is reasonable assurance that DAB could accommodate additional services (e.g. opening of a separate account with the Federal Reserve Bank of New York) that may be required by USAID in the event more direct assistance is granted by USAID to the GIRoA through direct budget support. The Control and Audit Office has limited capacity to conduct audits of donor-funded projects. CAO lacks qualified staff and the resources to build the capacity of its staff through training. The CAO will continue to require technical assistance from international or local audit firms in order to fully comply with USAID’s audit requirements. The limited capacity of the CAO to conduct audits of donor-funded projects is mitigated by the existing USAID audit requirements for the funds to be audited by approved audit firms as well as the financial review and oversight of USAID funds by the Mission’s Office of Financial Management. Recommendation 1: We recommend that the MoF-IAD increase its staffcapacity building efforts by soliciting externalfunding ofstudy tours, seminars/workshops, scholarships and other training opportunities. Similar capacity building support was previously provided to the CAO through USAID’s Capacity Development Project. Recommendation 2: We recommend that the CA Oformally seek external funding for focused technical assistance tofurther enhance its staffcapabilities and to provide them with the necessary resources (including equipment andfacilities) to develop necessary skills required in the performance oftheir audit responsibilities. The CAO needs more than the limited support previously provided under USAID’s Capacity Development Project for attendance ofCAO officials in regional conferences.